Dec. 1, 2016, 12:54 p.m.
How many news alerts will you tolerate on your smartphone’s lockscreen? Which organizations do you get them from? And what types of alerts do you prefer? “News Alerts and the Battle for the Lockscreen, a new report by Nic Newman for the Reuters Institute for the Study of Journalism, surveyed 7,577 adults in the U.S., U.K., Germany, and Taiwan who received notifications from news apps on their phones and said they engaged with the notifications frequently. 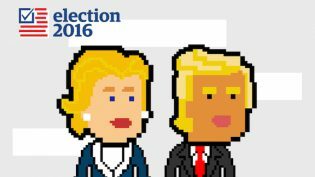 — Fox, CNN, and (surprise?) local TV news were the top U.S. brands for those who received news/sports alerts. Meanwhile, BBC News was by far the top source of news alerts in the U.K. (63 percent); the top brand in Germany was TV company n-tv; and Yahoo News was the most popular source in Taiwan, followed by Apple News. News organizations are working on this: The New York Times lets users separate out the kinds of alerts they get, for instance. 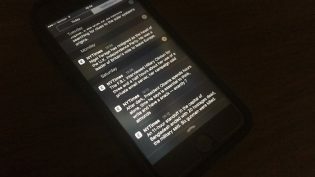 “We’re mindful of the fact that it may irritate our readers when they get alerts about things that aren’t breaking news,” the Times’ Karron Skog told Nieman Lab last year. Owen, Laura Hazard. "Study: Fox and CNN are the top news brands for smartphone alerts." Nieman Journalism Lab. Nieman Foundation for Journalism at Harvard, 1 Dec. 2016. Web. 20 Apr. 2019. Owen, Laura Hazard. 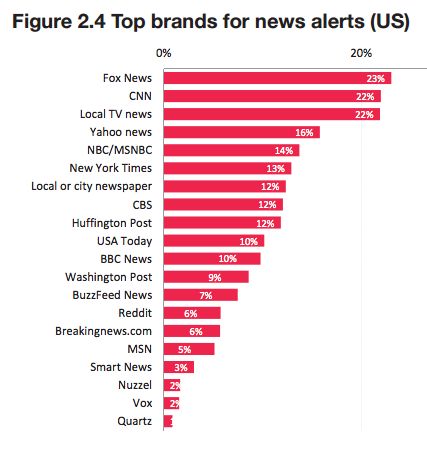 "Study: Fox and CNN are the top news brands for smartphone alerts." Nieman Journalism Lab. Last modified December 1, 2016. Accessed April 20, 2019. https://www.niemanlab.org/2016/12/study-fox-and-cnn-are-the-top-news-brands-for-smartphone-alerts/.